And now I know! 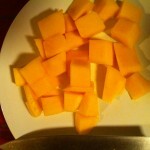 I always murder mangoes. I always get anxiety trying to deal with the pit. 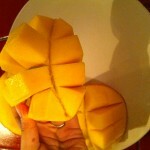 It’s silly how much emotion I have with fruit. 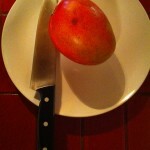 do mangoes come pitless too then?? or am I just interpreting the photos wrong? Wow! It looks so simple (and delicious). :^) I think the one I tried had a pit, which took me by surprise, because it was very much wanting to cling to its pit and not release, whence I didn’t know what to do. 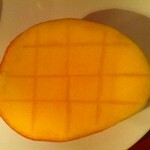 So having only eaten dried mango previously, I attempted to cut it into strips. It didn’t like that either, because the peel didn’t want to turn loose. 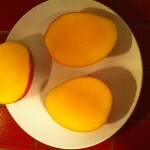 So, about these pitless mangoes…? 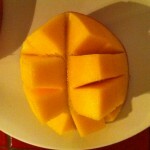 I totally cut up mangoes the same way! On a related note as per your request for other fruit cutting/dicing/slicing suggestions…I’m not sure if you have heard of this handy little gadget or not, but I present you with the Pineapple corer!! Although you’ll still have to brave them for the cubing part.